This is what happens to me every time I go through the car wash. To start with, I am a control freak, so putting the car in Neutral and letting go off the wheel is a real matter of trust moment. I think that all hell is going to break loose. Now, once the process has started, I am in a panic mode. I imagine that some steel beam is going to make a hole through the windshield, all that soap and water and the heavy pieces of material that wash the car, are going to come through and leave me faceless. This is really a moment of total surrender. Today was no different. I closed my eyes, which makes it worse because my imagination, and I have one that will break all the charts of taking off, starts working in overdrive. Air conditioner is off, music is off, so it is only me, the sound of monsters getting ready to get into action, perspiration going everywhere, and car totally out of my control and I am at the mercy of someone’s computer machine. 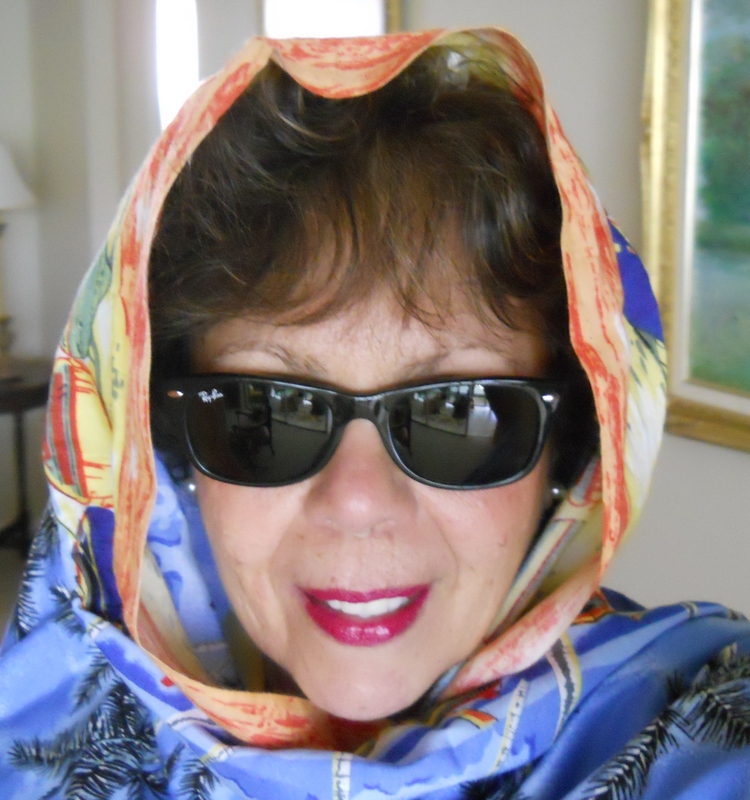 But today, two days older than the six decades plus I just had, I developed the guts and became fearless and thought, what the heck, faceless or not, I am going to take a picture to illustrate to my worldwide audience that I am a woman with no fears whatsoever! 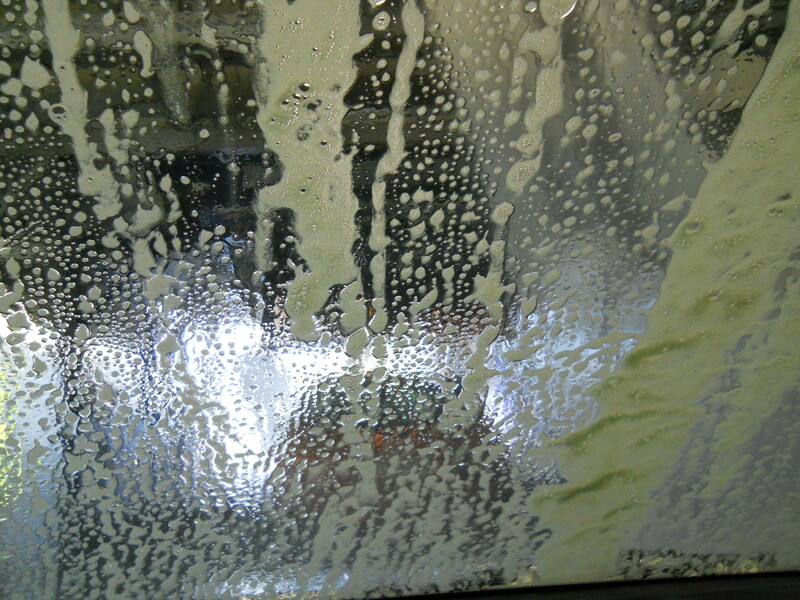 It only lasted a few seconds, because then I thought, yeah, that will be something for the blog, “Faceless woman found in flooded car with lots of soap trying to take a picture.” See, I told you, I am really endowed or gifted in the imagination department. Thank you God, but show me how to control it too. Have sparkling looking car, ready for the daughter’s approval. I am so excited to show her a very clean car and a mom with a face still in place. Having my birthday cake, still, and eating it too! This entry was posted in Uncategorized on October 23, 2015 by happycontessa. I have to admit, before I start blabbing away, I don’t think there is another soul like me. I really have an incredible imagination. So, ok, something is happening during my meditation time in the mornings, before I have my breakfast. Just after having water and coffee. Maybe it is the coffee. Too espresso like. This morning my mind took off to India, the region south of Chennai, in Tamil Nadu. Supposedly I am staying there for a week of mind cleansing and also the body, mind you and me. Need lots and lots of cleansing. Need to totally change my life around, but have no idea where the heck I should be heading. So…after getting up at 5 am, half asleep yet, I head to the room where the meditation takes place. There, very quietly, because I know how awkward I can be, I find a place to position myself in the Padmasana pose (Lotus pose). As soon as my derriere hits the cold surface, I know this is going to be one unforgettable experience. I have no derriere and my little bones are alerting me that they will not put up with this hard surface. Never mind, I tell my monkey mind. Then, as it is the case, most of the time in my life…a big humongous fly comes flying at supersonic speed around my nose. What the…! Not even in India I can have a moment of tranquility! Needless to say, profanity is not allowed in meditation or anywhere close on these grounds. Silence again… the superfly just disappeared from my life. I can breathe better and concentrate in my mantra. Which one again? So hum it is. Out of my left field, there comes not only the superfly (remember that movie? )…but her whole entourage. They are only surrounding me with an infernal buzz. What can I do? I bathed, I am clean, so why the convention of flies around me? Losing my pose, my calm and my good intentions of being a little bit holy, I start smacking back and forth around me, when then I noticed that insects probably are to be appreciated and allowed to do as they may, by the looks of the others towards me. Or maybe it is that I don’t have any makeup at that time of the day and I look like the mother of all superflies? That thought just hit me. No mirrors around to double-check how I really look with nothing on my face to cover up the bride of Frankenstein look when I first look at myself on the mirror, mirror on the wall…which by the way, I have trained my mirror to tell me I am the most beautiful of them all. It is that or seven years of bad luck. Well, that did it for me! This meditation session is just a supersonic nightmare. I am going back to Central Florida to my Queen Anne chair to meditate as I please. Must admit, for the past few days, I have definitely not been successful. Is it Mercury too close to Earth or just that I must change breakfast choices? Life is very long when even your meditation time turns out into a gargantuan fiasco moment. This entry was posted in Uncategorized on October 8, 2015 by happycontessa. There you have it! I had this incredible experience while hiking the Himalayas in the cutest, very trendy and fashionable outerwear outfit. Cute with kind of all colors, colors such as the ones you see while you are hiking Machu Pichu. Those vivid and so bright colors of the Native Peruvians. 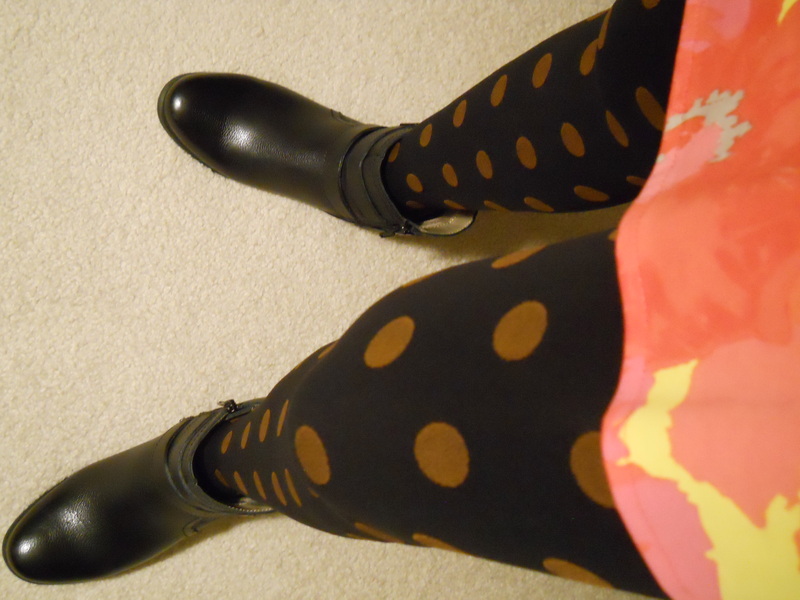 Lots of polka dots in my stockings. Love polka dots. But I was not at Machu Pichu, I was at the Himalayas. Boots, hat, scarf, my Ray Ban sunglasses and full of energy, gusto and ready to conquer one of the top places in the whole wide world. Mount Everest! So I am with all these people from all over the planet, all of them very nice, amiable, kind, like the ones from the era, “Peace, Love,” if you know what I mean. If you don’t know what I mean, well…that’s tough, because I don’t have the space and the time to go deep into it. Use your very smart imagination. Back to my hiking…there I am pulling myself up with a rope that I don’t have the foggiest idea who’s holding, maybe someone already at the top. I made sure I had cute undies, in case the people below me were looking up. I didn’t want to offend anyone with my all white gramma’s underwear. Oopsie, getting too personal. There I am…good hair day, the fresh air from that altitude, maybe 25,000 feet up, feels marvelous. I am handling that rope like I am a total expert doing this. Suddenly, and very suddenly…a mountain goat shows up from nowhere, the one with the arched horns, and his face is not at all friendly. He is on top of a space in the mountain that I must conquer if I want to make it to the summit. To the summit it is at all cost. But, the mountain goat is facing me down like saying, what the heck do you think you are doing here with the cutest outfit ever to have graced this mountain. He stared at me and started to bite on my rope…that’s when the situation went very sour…I thought, two things are going to happen here, one, I am going to make it to the summit, or there’s going to be a death splattered on the ground mountain goat. My meditation time was up, so I must continue my hike tomorrow, or maybe leave the story hanging loose just as it is. Don’t worry, the mountain goat survives, and I reach the summit with half of my undies shredded by the goat. It was a sight to behold, me on that rope going as fast as I could, and the goat chewing as fast as he could. We compromised halfway through and…pop, my oatmeal was ready. This entry was posted in Uncategorized on October 2, 2015 by happycontessa.